Jason Robinson is delighted to get back involved in rugby league - although he insists he never really left. The wing wizard won every domestic trophy during a glittering nine-year career with Wigan but will most be remembered for his deeds in rugby union and in particular for scoring England's match-winning try in the 2003 World Cup final. Now 44, Robinson is one of 21 ex-players named on a panel to choose the 2019 Steve Prescott Man of Steel as part of a new weekly process to determine the winner of the most prestigious individual prize in rugby league. Robinson says it was a "no-brainer" to join the likes of Ellery Hanley and Martin Offiah on the panel and help repay the debt he believes he owes to the game. "I've never been away," Robinson told PA. "Rugby league will always have a place in my life and wherever I can I'll actively promote it. "Even when I was in rugby union, I probably got more column inches for rugby league because they kept saying I was from Wigan. In a funny way, I just felt I was flying the flag for rugby league in rugby union. "I grew up with rugby league from the age of 10 and did that for 16 years. It's in my roots and it made me the player I became. "A lot of my work is now in rugby union but I've always done stuff on and off for the RFL and Super League and it's nice to play a bit more of a part in it." Robinson, who now lives in Huddersfield, was named in the Super League Dream Team four times, won the Harry Sunderland trophy in 1998 and lifted the Lance Todd Trophy in 1995 but the Man of Steel award eluded him. New Super League chief executive Robert Elstone has revamped the award, which was first presented in 1977, following criticism of the previous selection process which featured current Super League players. "It's certainly an honour to be on the panel," Robinson said. "The Man of Steel is the ultimate individual honour, one that I never got in all the stuff I won over the years. "I think this year we will definitely get it right. There's some big names with a lot of knowledge between the 21 and whoever carries that Man of Steel this year will certainly deserve it." Meanwhile, Robinson will relive one of his happiest memories on Sunday when his old club take on Sydney Roosters in the World Club Challenge. 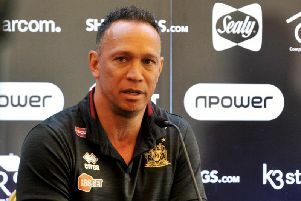 He was in the Wigan side that defied all expectations by beating Brisbane in Australia in 1994 and is hoping for more Super League success on Sunday. "Of all the games I played in, one of the best for me was '94," he said. "We were written off and, when you play against Australian teams, they see it as a weaker league. "So it's a great opportunity this week for the Wigan players to do something special."